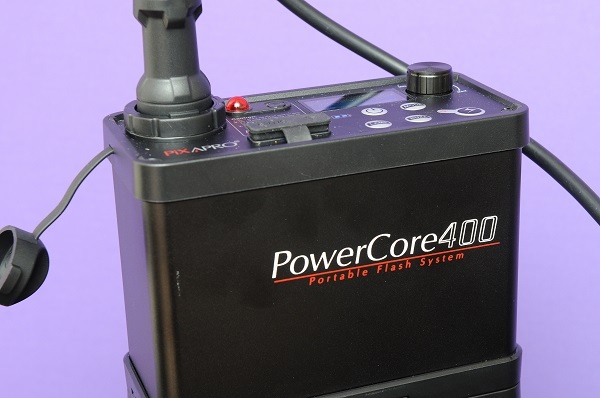 The PixaPro PowerCore 400 is a battery-powered portable light for location work, designed to be used hand held or on a stand. The PixaPro PowerCore 400 is a battery-powered portable light for location work, designed to be used hand held or on a stand. Flexibility seems to be the key to this light; you can use it on almost any fitting or walk around with it. It is entering a well-established niche, with several very well-regarded but quite pricey competitors. Retailing at £400 for a ready-to-go location (and studio) light, with its own carry case, it is aiming its sights squarely at users of products like the Elinchrom Quadra range (£1,120 for its entry-level product) and the Lencarta Safari (£849.99 for its entry-level product) and for users of generators like the Bowens Explorer (£1,340 for a pack that powers your existing studio light). 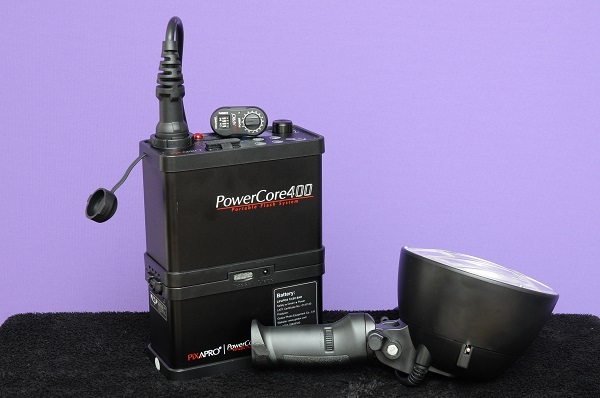 While the PowerCore 400 can only power the one head it is supplied with, it has a very respectable cycle time and good battery life. It is also less than half the price of the least expensive competitor. The battery pack is solid and feels well built. The control part can be separated from the battery part, letting you to swap out the battery for a spare and put the drained pack on charge. Working this way would allow you to work all day long, unless you were shooting at a very high rate. The battery pack has a reasonable weight in your hand so that it feels solid, but it isn’t unduly heavy for carrying around on a shoot and comes with a solid enough bag and shoulder strap to make that easy. 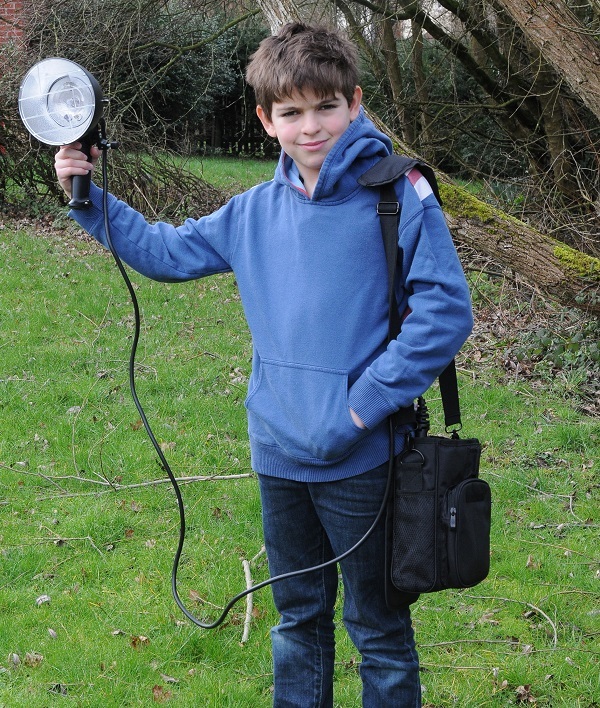 I have included a photo of my ten-year-old lad with the unit to demonstrate its portability. The head itself feels less solid and the plastic housing doesn’t feel as nice or as solid as some more expensive units like the Quadra and the Safari units, but then the unit is considerably less expensive than anything else similar I have seen on the market at this time. On the other hand, the head it is light as anything and using it is simplicity itself. You could happily hold it in your hand most of the day using the built-in reflector and shower cap-style diffuser. I tried a selection of Bowens-fit reflectors and a large brolly with the head; none had any problems attaching to the unit. Nevertheless, with the head being quite lightweight, I would think twice about fitting big heavy soft boxes or huge umbrellas. Plainly it is designed for ease of use and portability rather than for massive light modifiers; I am fairly sure the head would be damaged by a two-meter soft box. 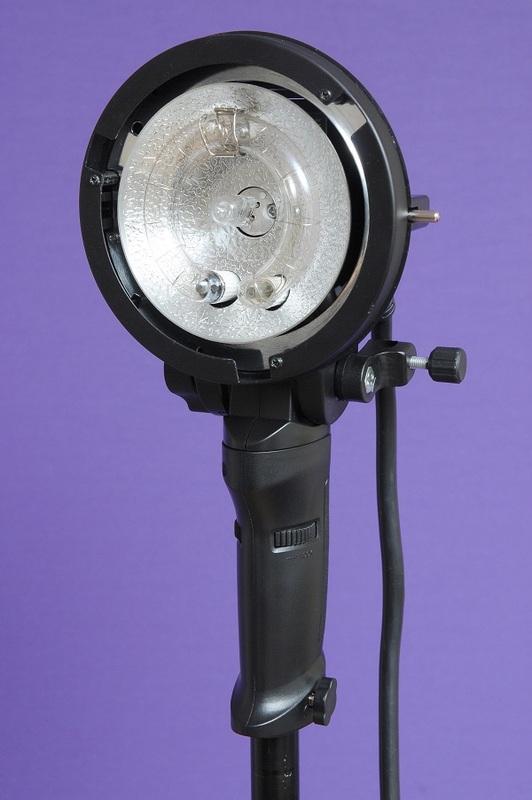 Having said that, if you need a two meter soft box in a field, you probably are not going to be using a battery flash head that costs as little as four hundred pounds. 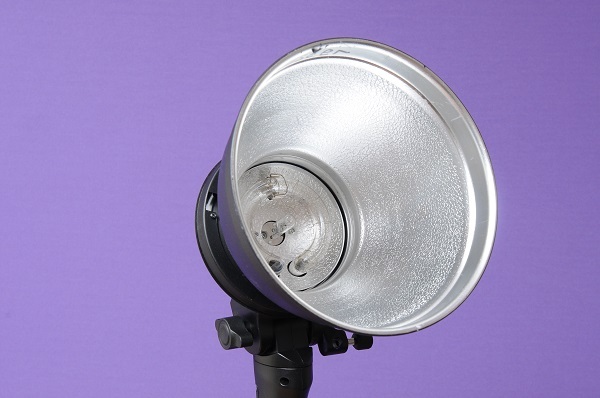 If you need a soft box that big in a studio, then you are probably going to be using a mains-powered flash unit. 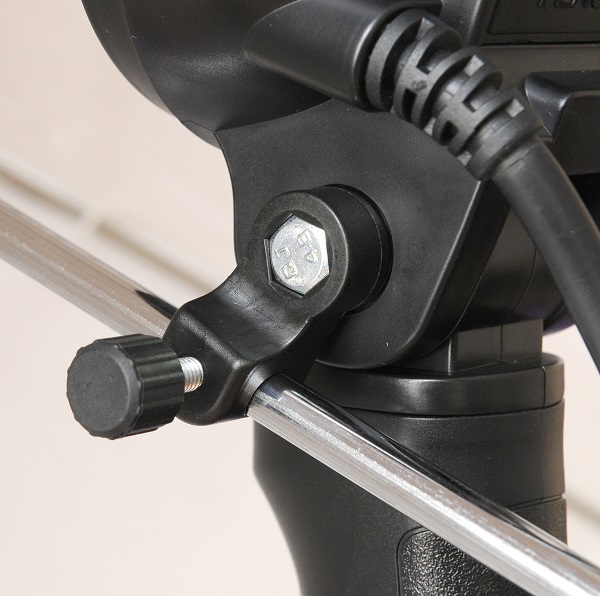 The flash head comes with a carry handle which has a standard light stand fitting at the bottom of it and can be removed to reveal a hot shoe fitting; this allows the light to be hand held or attached to most light stands. Just like more expensive units, the head is just a head, so the controls are on the battery pack. The PowerCore has six full stops of power control from full power down to 1/32, in third stops, making a total of sixteen power settings. I was pleased with this: as I often mention, power needs control and I have seen plenty of units with as few as five or six power levels. Most of my own work is social event or schools-based, so I am working with portable studios every day and the more control there is, the better. I tested the unit out at a family-orientated tribute night, with a studio for family and friendship photos, mixed in with other PixaPro lights. Against my own advice, I popped a 180cm brolly on it for a fill and it worked all night with no problems, I have doubts about the umbrella attachment liking brollies that large all the time though. I do adjust the power of my fill according to the size of the group I am photographing and, to be honest, once I set the light up I kind of forgot about it except when doing big groups, when I turned the fill up to ensure everyone had enough light on their faces. My light meter told me that the power output was consistent and the battery pack lasted all night, although I was providing modelling lights from the mains-powered PixaPro side lights. I would put a word of caution in though: if you use the modelling light all the time then you can expect the battery life to drop considerably, these things really like power. Still, it might be handy doing dusk and night shots outside at weddings. This can be done by all the usual methods: there is a slave cell, a synch socket and the (now familiar) Godox-style USB receiver port. The USB receiver dongle is an optional extra, but I think the supplier sometimes has offers including a trigger and receiver, so it is worth a call. A nice feature for the strobists out there is the three main modes: Standard, S1 and S2. Standard is triggered by the synch or the USB receiver. S1 of course is based on a slave cell and S2 is slave cell based, but it ignores the pre-flashes generated by TTL speedlights. This would allow you to mix the unit with a speedlight system quite nicely. You can also adjust the power using the transmitter. I tested this out and it worked nicely, although I admit that when I did need to adjust it, I just turned the power knob since I was standing right by the light. 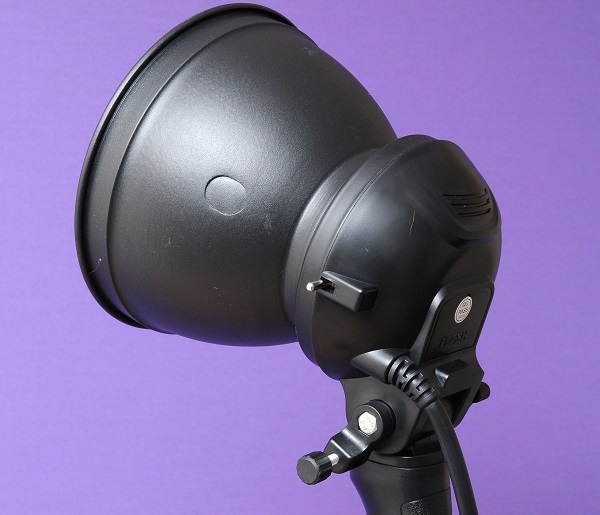 I also use hair lights a lot and this head would make a fantastic lightweight hair light, but the cable to the head isn’t quite long enough to reach to the ground with the light on top of a eight or nine foot high background. Apparently an extension may be available at some stage soon, so I will let you know about that if I get any information. Hanging the battery pack off the rear of a background isn’t the end of the world, but it would be handy to have it on the floor. It is a difficult one to make recommendations across the board on this product as it fits several niches. If the head were made a bit more solidly, then I might be tempted to say it is a no-brainer, just buy them and use them both in the studio and on location. There are more solid heads on the market and some other products will take two heads on the same battery pack. However, they are a LOT more money and in some cases will only work on fixed asymmetric power ratios. Indeed, I have found myself comparing the PowerCore with products that cost two or three times the money, so that tells you something about how much I liked it. Is it quite as good as the well-established market leaders? Er, no, sorry. Is it very good for the money? Absolutely. If you need an easy-to-use flash with a lightweight head then it does the job nicely, but don’t hang massive light modifiers off it. Medium-sized ones should be fine. Available now, you can buy the Pixapro PowerCore 400 from Essential Photo.